A white flag with centred arms. (also available as animated image at https://de.depositphotos.com/141131340/stock-video-close-up-of-waving-flag.html but I am in doubt, whether there is more than an animation). https://en.wikipedia.org/wiki/University_of_Paris#/media/File:Coat_of_arms_of_the_University_of_Paris.svg), similar but distinct: fleurs-de-lis instead of coronets in different order, close book instead of open book. In general, most of the college boat clubs fly a banner of arms of the college concerned. The best time to see these flags are during Eights Week, in 5th Week of Trinity term in late May and during Torpids in Hilary term, in February. These are regattas held on the River Thames, featuring crews from most of the colleges and private halls, plus a few other organisations (medical schools & so on) connected with the University. The majority of the college boat houses are located on the Thames in Christ Church Meadow and this is where and when you can see the most colourful display of flags in Oxford, as each boat houses flies at least one flag during Eights Week and Torpids. Many fly more than one as the boat houses are shared between colleges. It is possible that some of the college boat clubs have their own individual flags. You can also see college flags at their own premises elsewhere in the City on other occasions, mainly associated with the University, the death of college Fellows and so on. They tend to fly the Union Flag on national occasions. However, the greatest concentration in a small area is during Torpids and Eights Week. Most boat clubs borrow a banner of arms from the Porter for the day. The postcards [linked above] are historical, rather than a reflection of current practice. I am not sure there are any hard and fast rules in respect of the construction of these flags; if anything it looks rather good that there are some unusual sizes and ratios along that stretch of the river in Christ Church Meadow. 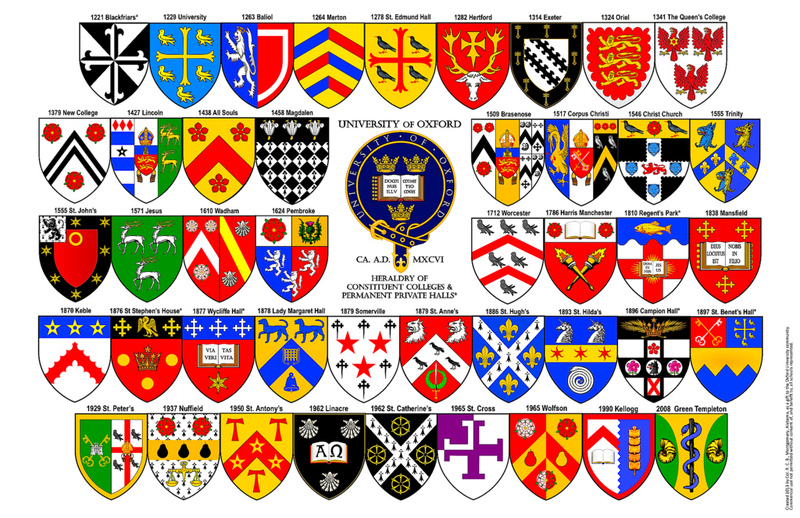 Boat clubs of Oxford colleges have crests, but the pattern isn’t unique. Many of them display the college arms superimposing a pair of oars in saltire, others display the oars in saltire with the coat of arms above, some a logo or the club flag pattern instead the coat of arms. St. John’s Boat Club has additional club arms, having the pattern of the club flag. All others have in common that the crest also displays the blade pattern. An example can be seen for Worcester College, which is the only one to display two different blade patterns, one for the men's crew, one for the women's crew. The coat of arms in the crest displays the college pattern but in the boat club colours pink and black. (…) A charming 18th Century engraving displaying the coats of arms of the major colleges in Oxford, which was published in John Owen and Emanuel Bowen's pocket road atlas, Britannia Depicta or Ogilby Improv'd (London: T. Bowles, 1720). The mileage chart above relates to the road from Oxford to Cambridge. 'Britannia Depicta' (1720-1764) was one of the most popular atlases of the 18th century being published in many editions for close to fifty years. The maps themselves were engraved by Emanuel Bowen (1694?-1767), who was one of the most renowned and prolific map makers of the period. As with many of his maps, he has included copious amounts of text -- written by John Owen -- describing the county. An original copperplate engraving with later hand colour was available. The printed areas are approximately 11.6 cms by 18.2 cms. (…) Guaranteed to be over 290 years old” at https://www.wellandantiquemaps.co.uk/arms-colleges-c-oxford-j-owen-e-bowen-c1720. Probably due to physical limits the heraldic metals might be not always depicted properly. 2) The tincture of stars is not always recognisable (Lincoln, St. John’s). 4) Merton had used the current pattern in a Baroque shield. 5) Exeter: bordure Gules instead of Sable. 8) Brasenose: the quartered arms at sinister here have different chevron tinctures, those of Sutton with horns are Sable, but those of Southworth with crosslets are Gules. 11) New: Round badge charged with the colleges arms surrounded by the belt (Azure) of the Order of the Garter without shield.